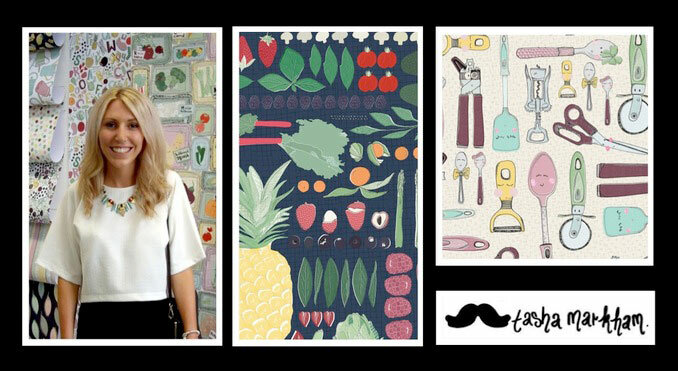 Utelier spoke to surface pattern illustrator Tasha Markham, to find out about her current projects and what she has planned for the near future. 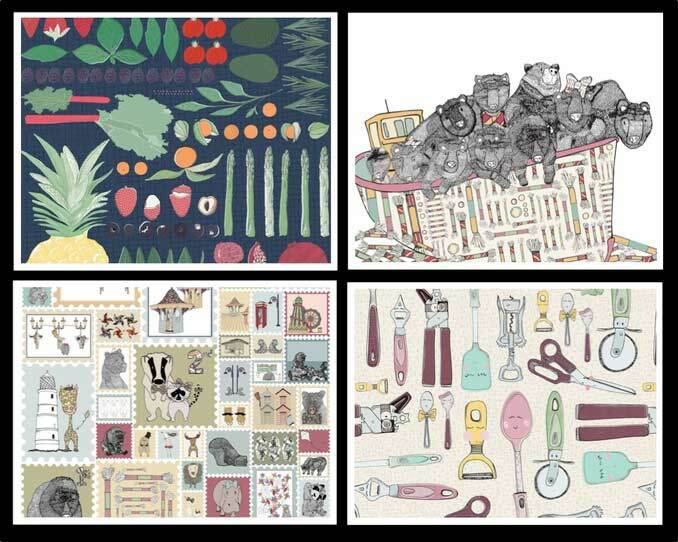 Surface Pattern Illustrator Tasha Markham is an imaginative print designer who graduated from Leeds College of Art with a degree in Printed Textiles and Surface Pattern Design. Her unique and quirky style of printed kitchen utensils and vegetables with smiley faces is a niche within the childrenswear market. It is often hard after leaving university to adjust from education to industry, especially in the design and production world where experience is the key to success. Various designing internships and graduate schemes are put in place to help graduates after university; however, many designers have to freelance and find experience and opportunities themselves in order to update their portfolio and keep up to date with current trends. The Oxfordshire-based designer is self-motivated with an ambition to work alongside a creative design team to build on her newfound print and textile skills she learnt whilst studying for her degree. During her final year at University, she was approached by Graham & Brown to work with them after she was recognised for a wallpaper design that was exhibited at the Imago Gallery. Tasha was also lucky enough to work with a wide variety of designers at Asda George, during their Autumn Winter 2013 /14 Girlswear collection, where she had an active design placement. Tasha Markham enjoys drawing and creating collages and has recently got back from travelling South-East Asia and Australia as a source of inspiration for her future work. Pattern design, photography and cups of tea are what keeps her motivated. Being a graduate designer, it is often hard to source work and to make a transition to real life industry experience. We got the chance to speak to Tasha, to ask her how she has gained experience and projects as a freelancer since leaving further education. Originally from a small village in Oxfordshire, I was fortunate enough to have plenty of inspiration on my door-step. The catchment school was a Visual Arts College where I also stayed to achieve A-level qualifications. After that, I attended a Foundation Diploma in Art and Design at the nearby College, later confirming my place at Leeds College of Art where I obtained my degree. I feel I owe a lot to the printed textiles course at Chenderit Visual Arts College at both secondary and A-level stages. The encouragement and amazing resources confirmed my love for print and pattern, which in turn ensured I continued to further my education to degree level. I am now based back in Oxfordshire. I enjoyed my time further north in Leeds at university and have since travelled around Australia and South East Asia in a pursuit of pattern. However, I feel the ideal location of home serves me well in the South of England. You went to the Leeds College of Art, take me through your degree, what did you enjoy and how was your university experience? I thoroughly enjoyed the university experience; The Printed Textiles and Surface Pattern Design course was dynamic and pushed myself as a designer. Course leaders considered us to be less like students but instead as practising professionals and so we acted accordingly. The time invested in project briefs was intense but worthwhile as I established my design approach. By the third year, I was certain of my illustrative drawing techniques and the target market I was keen to work for. The course combined a series of disciplines across a broad spectrum of print techniques. A focus on project briefs but also placements, book fairs, multi-discipline electives, trade fair visits and exhibits abroad all aided the establishment of us as young professionals. Have you gained any professional experiences since graduating such as internships and graduate schemes? To ensure I built on the success of the degree course I continued to work hard and continually promote myself as a designer. Via social media sites and my personal website documented my journey as a graduate. From this Keka Case – Solid Line Products approached me to design a collection for tablet and mobile devices. A previous placement with the Girlswear team at Asda George meant that my designs began to feature in the Autumn Winter 2013/14 collections providing a strong base for self-promotion online. Since graduating I have attained a freelance designer position for Doodlebone. The design-led pet apparel company is unlike anything I had done before; I worked closely with the brand and studied the existing portfolio to ensure I could build on the existing handwriting. A logo and signature pattern has been produced alongside a series of other seasonal motifs; these are expected to be launched next spring. What has been your greatest achievement as a designer to experience to date? Exhibiting at the Imago Gallery London was a highlight in my design career. Canapés and an invitation-only opening evening during London Design week allowed for a real sense of achievement for all involved. Recognition for a wallpaper design by Graham and Brown and the granting of a placement heightened the experience further. This Saville Row location, which was later followed by a celebration evening and exhibition in The House of Lords was all in all an amazing experience. Making the transition from academic to industry is difficult and continues to be a challenge as I try to further my career. Working within a competitive industry is difficult as there is plenty of competition to contend with. It is important to not let setbacks deter you from goals but instead use it as motivation. Stick with it and perceiver! Today’s technology means that everything is easily accessible and so it is a great time to tap into these readily available resources. My website and strong online presence across all social media platforms and strong online presence across all social media platforms have been a key factor in the establishment of myself as a designer. Facebook, Twitter, Instagram, Tumblr and LinkedIn can all be used hand in hand and work together in creating awareness of yourself as a new freelance designer. How do you source your inspiration? I have just returned from travelling in Australia and South East Asia where I sourced lots of new inspirations and ideas. I like to collate photographs, fabrics, postcards, promotional literature, maps and tickets to build up a trend or story and then take ideas from there. I do not currently have a studio but more of an office space. I largely work digitally so as much as I would like a huge space I don’t need one quite yet. It is something I hope to progress to one day. Do you have any jobs on the sideline? I currently work for a luxury retail brand alongside freelancing. Working in a retail environment does not directly link to my design aspirations but gives me an up to date awareness of trends and the commercial market. The target-driven company and emphasis upon client demands heighten my interpersonal skills, which are of course invaluable in any given industry. What has been your favourite collection and why? Fresh Thinking was the title of my final project at Leeds. The theme was one that I felt passionately about as it deals with the topical issue of healthy eating within the younger years and the current trend of growing your own. A brief was written in response to the final major project requirements, and so the collection exemplified all that I had learnt up until that point, therefore, reflecting a journey through the degree course. The designs produced across both fashion and interior contexts within this project represent how my illustrative style can translate across frameworks and demonstrates my strong illustrative style. 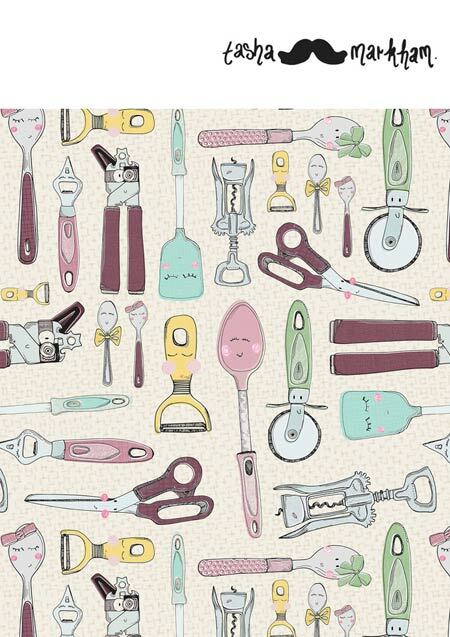 To view surface pattern illustrator Tasha Markham’s portfolio please visit her Utelier profile.